Thought it might be fun to try one of these. After doing a little research, it turns out there are all sorts of benefits to wooden combs over plastic. Not the least of which is the complete lack of static. It’s also more gentle on your scalp. And the wood fibers help to spread natural oils from root to tip. Pretty neat. I wasn’t following any plans and I was designing on the fly, so I had to figure out each process as I went. Not counting drying time for glue, this took me a couple of hours to do. But if I really get set up the way I want, I can knock these out in batches and spend much less time for each one. The grain of the walnut and mahogany run perpendicular to each other, and make for a very strong little piece. The walnut dowels go completely through each end. The individual comb teeth are surprisingly strong, and nothing short of very deliberate abuse will break them. Just a little over five inches (~13 cm). I built it by eye, not really trying to fit any exact measurement. Nice project, looks good. Didn’t realize a plastic comb had so many disadvantages, slick. And no problem with the teeth breaking, all worked out great. I noticed the great uniform spacing and line at the top of the teeth, use a jig of some sorts? That is a great comb. I did not know about plastic being so bad either. How did you cut the teeth if you don’t mind me asking? Max – I make the first cut, then clamp an auxiliary fence to my cross cut sled. 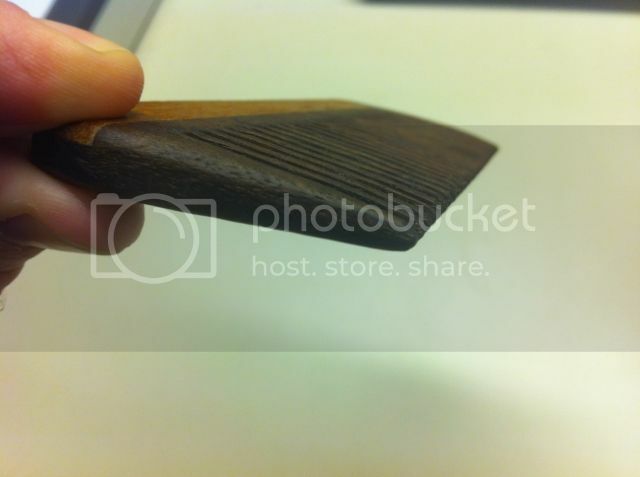 The fence has an index pin that fits perfectly into the kerf left by the table saw blade. Make my second cut, then move the second kerf onto the index pin and cut. And so on, until you have as many teeth as you want. Couldn’t be simpler, actually. It takes all the guesswork and measuring out of the equation, and makes for a repeatable process that requires zero brainpower, yet yields perfectly spaced cuts. I like it Brian. The no-static thing could be a big seller. Brian, this is a great project! I imagine the static in the winter is as bad in Texas as it is in Oklahoma. Are the teeth tapered at all? Could you post a close up pic of the joinery? What finish did you use? Thanks for sharing. Roger – Thanks. That’s the hope! Candy – Thanks. The teeth have a light taper towards the rounded tips. I snapped a picture for you to illustrate. Here’s a closeup of the joinery. I just used boiled linseed oil. The colors have lightened up a bit after drying. The pictures I used earlier were taken when the comb was still a tad wet. I’m thinking of investing in the Beall buffing system to get these to a really nice high sheen. as someone who sell something like those in craft fairs, people, ladies mostly, don’t think that they are of use, they think that they are decorative, when i tell them to tried them, they love them and most of the time they buy it. what i do different is that i cut the teeth in the scrollsaw, that way i can make the separation a little less than a table saw. 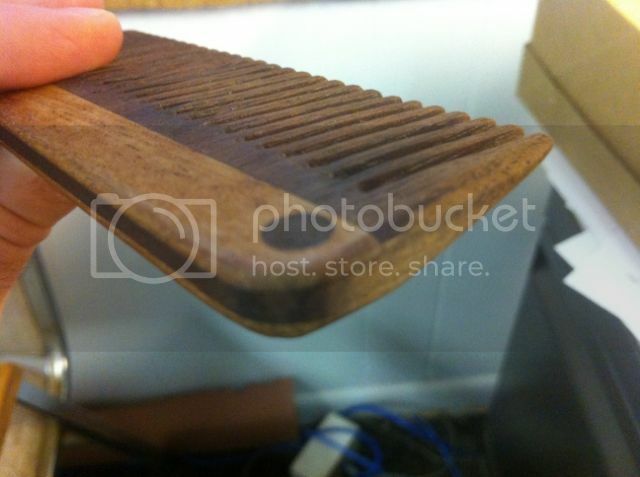 again, that’s a nice and strong looking comb. Nayo – Thanks. Do you have any pictures of your combs online? I didn’t see them on your projects page. Using a scroll saw for all those teeth sounds like a nerve wracking task. Very cool and great idea. I would very much like to make this for a gift. Awesome work on that great looking comb. Perfect cuts and amazing joints. Like it and it’s way better than plastic ones. Such a beautiful comb! Looks like a lot of work sanding between the teeth, but th end result is great.